From Marmit. 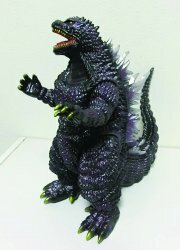 The Millennium version of Godzilla from Godzilla 2000 is strangely cute as this 8 5/8" tall soft vinyl Sofubi figure! Previews Exclusive by Marmit. 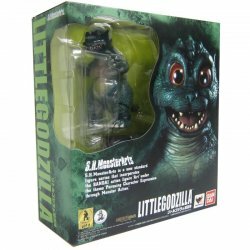 Add to your Godzilla collection with Godzilla from Godzilla 2000 Sofubi Monster Heaven Vinyl Figure! Collector's Note: Stock photo of figure out of box was supplied by Diamond Comic Distributors. The color scheme of the actual figure itself more accurately matches the color scheme of the figure shown on the box. Generic cardboard box packaging is not meant to be collectible and is made of soft thin cardboard and will have various crimped edges as pulled from manufacturers shipping carton. If the condition of this box is important to you please contact us and we will pick the nicest we have available.